I can’t decide what genre this album is. Is it punk? Kind of sounds like it on the opening track, “Santa Barbara” This tune could be a B-52s song. Fun party song. Then there’s some fun funky guitar on “Skin Hunger”. By track 7 (“Delight Me”) I’m completely confused. This is sort of a poppy dirge if there can be such a thing. It’s got an almost rock-a-billy sound. Reminding me of an old, now defunct group, Tarnation. 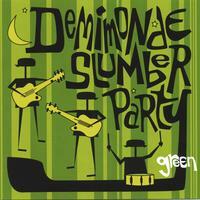 Demimonde Slumber Party is obviously talented and have put together a nice fun collection of well written, well performed songs. It’s an eclectic band that has released a fun and interesting CD. For something fun and new give them a spin. Stand out songs: “Santa Barbara”, “Velveteen” reminds me of a Ramones song. I really like “Delight Me”.